Offering kneeboard rentals and instruction for those renting or charting watercraft at Lake Powell. A kneeboard is a board ridden in a kneeling position. Knee boarding is riding while being towed behind a boat or jet ski on a lake, reservoir, or river. Kneeboard riders are requred to wear life jackets for safety. This is a great water sport to enjoy while boating. Towing a knee boarding is an offshoot of kneeboard surfing; kneeboard riders compete tricks, and expression session events. 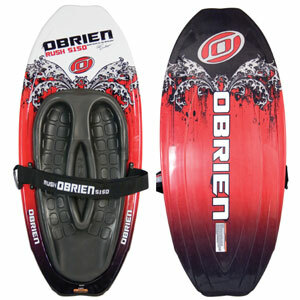 Towed kneeboards have a padded deck contoured to the shape of the and knees and a strap holds the rider to the board. We carry several different brands and model of kneeboarding rentals at Lake Powell and must be rented with a watercraft rental.